A nicely-designed watch but one that still needs some work to make it a real contender in the smartwatch arena. The LG Watch Urbane LTE is a slightly odd watch - it shares the name of the newly announced LG Watch Urbane, but doesn't run Android Wear and has a different design. 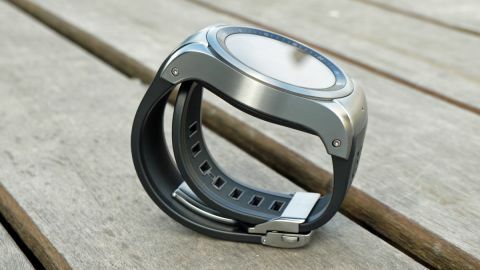 This circular smartwatch uses LG's own wearable platform, based partly on the webOS platform the South Korean brand acquired in 2013. It's got more buttons than standard Android Wear, with three adorning the side of the watch - but why this watch exists might seem like something of a mystery to many. The simple reason is LG wanted to lump LTE and NFC payments, which might not be that widespread around the world in terms of carrier availability and support - so there's a good chance this watch might not do all the things you bought it for in the first place, depending on your region. The LG Watch Urbane is a much chunkier device than most smartwatches out there. It's got a thicker bezel, larger buttons on the side and just feels larger on the wrist. Coming from someone that wears a running watch daily, and often gets comments on its size, that shows just how large it feels. The metal build is thoroughly premium though - play with the clasp-based band and you get the sensation this is a well-made piece of technology. And the thickness does make sense when you consider what's in there: an LTE chip to allow you to make calls and receive data wherever you are, NFC for payments and a heart rate monitor underneath for health tracking. So it's big and it is weighty but given the technology under the hood, this does make a modicum of sense. This is where things get tricky - it's very hard to work out how to use the Watch Urbane LTE when you pick it up for the first time. The central physical button will always take you home, and the top option to the quick settings screen, but other than that it all feels a bit random. The confusing interface is further complicated by the need to touch once in a while - the apps menu, for instance, is a scrolling wheel, but the physical buttons don't cycle through it - instead that's done with swipes. The apps themselves are odd too - they're well made for the circular 320 x 320 P-OLED 1.3-inch display, and the screen can fire very brightly. But tapping in and out takes a while as the interface feels slightly slower than most, and it's not always easy to swipe from one place to the next. Calling is something many won't want to do on a watch regularly, although the interface to do so should be fairly simple to use. Taking calls will probably be an easier way to use it, and the battery being nearly double the size of standard Android Wear should ensure the power won't die suddenly. This is another place where the LG Watch Urbane LTE gets confusing: it's capable of working by itself, but as things like the music controller attest, a smartphone connection is desired so it can get more information. If it's not present, but paired, the two can can share information through the cloud - but it all keeps pointing to the question of why you'd want this likely more expensive option over the Android-based G Watch. I can't see the LG Watch Urbane making many waves in the consumer market, at least globally. Perhaps in places where LTE-enabled wearables are more prevalent (there's a reason it's launching in South Korea first) it will have more success, especially if it can be used for payments untethered from a smartphone. But it feels like LG is just waiting for Android Wear to catch up with the technical things it wants to do. This larger, chunkier watch seems to be a side project, which would make me worry for the long term support. It does highlight that Android Wear needs a few more technological tricks to make it a more viable smartwatch platform, but for now, the Watch Urbane LTE isn't likely to be the thing you've felt was missing from your wrist.